The yellow flag is situated at the back end of the beach on a boat, hardly visible to beach-goers. HUMBOLDT PARK — At the very back end of the Humboldt Park beach, many yards from where people are allowed to swim, a yellow flag flaps in the wind. Hardly anyone at the beach notices the flag, but it's been there the majority of the summer. The flag is supposed to signal an important message: Swim at your own risk. The water may not be safe. Humboldt Park beach is by far the most bacteria-ridden beach in the city. City officials say it's likely because of bird poop at the inland beach that hasn't washed away. "I thought the flag was there because it's where the boats park," said Catalina Willarson, 40, who takes her 4-year-old daughter to the beach at least once a week during the summer. When a DNAinfo Chicago reporter told her the yellow "swim advisory" flag had become a fixture at the beach, Willarson said going forward she'll think twice about letting her daughter dunk her head in the water — or even swim at all. According to city data, the Humboldt Park beach water had Enterococci bacteria levels higher than the U.S. Environmental Protection Agency standard about 65 percent of the summer — the main reason why the yellow flag has become a fixture at the beach. Water is safe if Enterococci levels are below 1,000 calibrator cell equivalents per 100 milliliters. While it's not necessarily harmful on its own, Enterococci is a sign that poop or bacteria associated with poop is in the water. The bacteria can lead to diseases like giardia and salmonella. This summer the Humboldt Park beach has reached Enterococci levels nearly 18 times safe levels as advised by the EPA. At one point, the beach was above safe Enterococci levels for at least 31 consecutive days. The city publicly shares data on 20 of its 27 beaches. This summer, Humboldt Park beach came in at safe levels at just 35 percent of the days measured. The next worse beach was Montrose Beach, which had safe levels about 80 percent of the time. Under the park district's notification system, the yellow "swim advisory" flag means swimming is permitted, but caution is advised due to high bacteria levels or unpredictable weather. 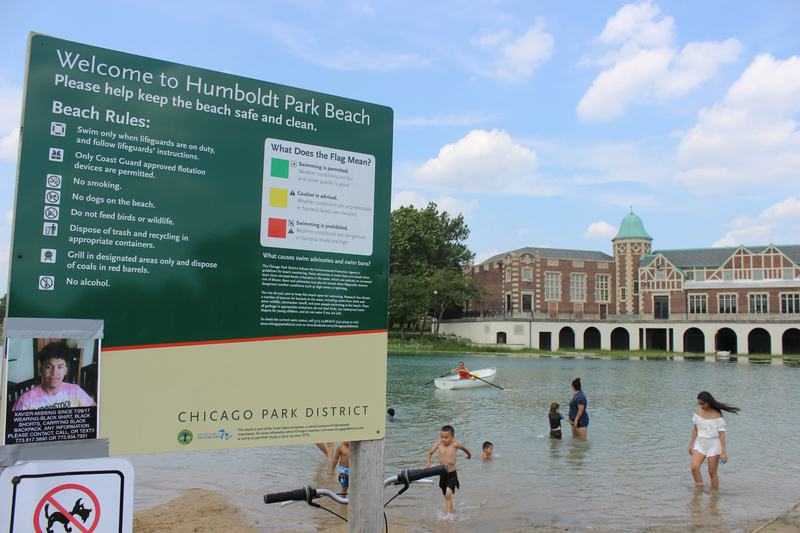 In the case of Humboldt Park beach, high bacteria levels — not unpredictable weather — is the reason the beach is frequently under "swim advisory," data shows. The red flag, the worst of the three, means swimming is not permitted due to dangerous weather like rough surf or lightning. The green flag means there are no water quality or weather issues and it's totally safe to swim. As recently as May, the city expanded its water quality testing program at city beaches after securing a $500,000 contract with University of Illinois at Chicago. The newly-established "rapid test" method detects Enterococci instead of culturing live E. coli bacteria cells in about four hours, down from the 18 to 24 hours it took before. What's wrong with Humboldt Park beach's water? Officials with the Chicago Park District said they're aware of the bacteria problem at the Humboldt Park beach. "It has been under advisory more than other beaches, and we're working on figuring that out," said Cathy Breitenbach, director of cultural and natural resources for the city agency. Breitenbach said goose poop is mostly to blame, calling it "one of the dominant sources" of bacteria at the beach. "The geese are awfully productive," she said. Unlike lakeside beaches, the Humboldt Park beach has a lot of short grass around its perimeter, which geese like because they can see better, Breitenbach explained. The park district is planning to install taller, native grass this fall to better enclose the beach and keep the geese out, according to Breitenbach. She said the park district is also planning to do more education on bacteria. Beachgoers can help make the water more safe by picking up after their pets and making sure their small children are wearing waterproof swimwear to prevent leaky diapers, she said. "It's a much smaller body of water than lakeside beaches, so these things can have a big impact," she said. Water flow hasn't been identified as a problem — "the way it was designed should be adequate," Breitenbach said — but the park district is currently examining the water system to make sure the water is flowing correctly. Park district officials said they're already starting to see improvements to the water quality after making some tweaks. On Friday, several days after DNAinfo Chicago first reached out to the agency for this story, the bacteria level was down to 5. "We can't say for sure what's going to work yet, just that we are working on it. And we hope people will help us," Breitenbachsaid. One immediate action the park district could take, beachgoers say, is to make sure the yellow flag is more prominently displayed so people can make a more informed decision. Breitenbach was receptive to the idea of moving the flag closer to the sand. "If we're hearing from folks that they're not getting the information, we want to make it more accessible. That's definitely something we'd consider," she said. The inland beach project was the first of its kind in Chicago, and maybe the country, according to a 1973 Tribune article detailing the dig. Saying it was too expensive to fill the swimming hole, the city closed the beach in 2015, which sparked protests among community leaders and neighbors. The city reopened the beach last summer to great fanfare. It's unclear how the water quality compares before and after the beach reopened. Officials with the park district said the agency doesn't have Enterococci numbers from before the beach was renovated. Even if it did, the city is using a new rapid test method, which would make the comparison difficult, according to officials. "You can’t compare the actual test results since the unit of measurement is different for the two tests," park district spokeswoman Zvezdana Kubat said in an email. 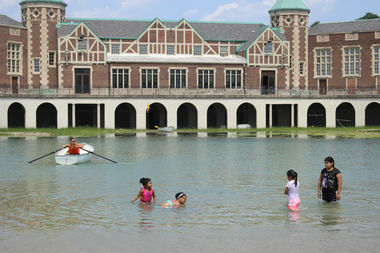 The frequent "swim advisory" nowadays at Humboldt Park beach isn't an issue for some beachgoers. "If it was hot enough, I'd probably still get in the water. It doesn't sway me that much," 30-year-old Alex Pastor said while sitting in the sand with his two friends. That opinion was shared by Alex Mendoza, 40. "The risk is small, so it's OK," Mendoza said as he watched his kids splash around. But others, like Willarson, say the bacteria problem is not only unsettling, but it also undermines how hard the community fought to reopen the beach. "They spent a lot of money [on getting the beach back] and we're not secure with our kids here?" Willarson said rhetorically.